How can high schools prepare the graduates that employers need? ACE Leadership High School was created with that question in mind. ACE stands for Architecture, Construction, and Engineering and is leading the way for workforce development. Albuquerque has a low graduation rate. Students may drop out due to economic pressures, academic deficiencies, unmet needs, or lack of relevancy. Meanwhile, New Mexico often does not have enough skilled workers for key industries. The challenge was to create a high school that could meet the needs of students and provide relevant curriculum and instruction while producing graduates ready to take on skilled jobs in key industries. 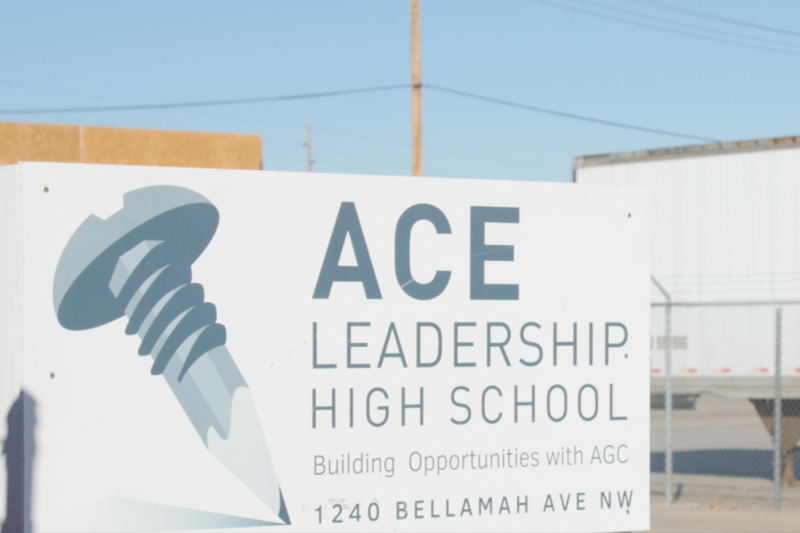 Through a partnership with Associated General Contractors of New Mexico, ACE (Architecture, Construction, and Engineering) Leadership High School was created to produce graduates who are interested and prepared to become part of the construction industry, which is so vital to the economy of Albuquerque and New Mexico. In addition to completing courses, each student works to develop a solid reputation, community network, and extensive resume that can be presented to potential employers. The Association of Builders and Contractors has a clear vision of what is needed in its workforce. The workers and future leaders of the industry need to be problem-solvers who work collaboratively. They need solid skills in reading, writing, and mathematics. They need to be skilled communicators who can listen and speak clearly. Finally, they need to have a great reputation and a solid work ethic. This is very different than the traditional skills-based vocational training that has been the staple of workforce development for decades. ACE is based on a new model of workforce development created by New Mexico’s Leadership High School Network. The ACE curriculum is structured around project-based learning. Students are continually supported in developing their basic skills. Throughout their time at ACE, students work to develop their resumes and reputations so they will be ready to assume important positions within the construction industry. Many students at ACE come with personal challenges that create barriers to learning and progress. The school recognizes this and provides a wide variety of supports to ensure students can keep moving forward. There is a medical clinic on-site and a student support center where students can receive counseling from a staff of social workers. The school offers a flexible schedule so that students can take classes during the day or in the evening to accommodate personal needs to work or care for children. The biggest indicator of success at ACE is that industry leaders seek out the school's graduates to work for them. After just a couple of graduating classes, this is happening. Graduation rates of ACE students are higher than similar populations in other Albuquerque public schools. ACE is working with the University of New Mexico to quantify the learning of students. It is challenging, for example, to demonstrate the professional behavior of building a reputation. ACE is a charter school and must be renewed every three to five years. Renewal often hinges on state standardized test scores. This has been a challenge at ACE. The school is working with the University of New Mexico to create a valid, reliable assessment that will provide similar information to the state tests and will quantify student progress in a way that is familiar to state officials. Performance assessments are also used to quantify student progress. It is critical to ensure rigor in this form of assessment through public exhibitions and continual norming of rubrics. Teacher certification can be an area where charter schools face challenges. Teachers at ACE work in teams to lead student projects. They are paired based on their credentials and their interest in each project. 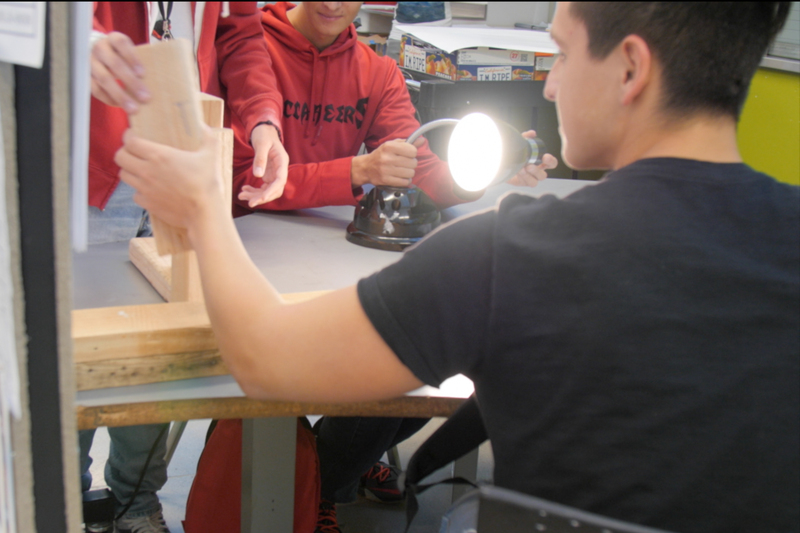 Having two or more teachers on each project allows students to earn multiple credits for their work. Planning for each term begins months in advance. Ideas for potential projects, using a project-based learning (PBL) framework, are discussed. The ideas may come from students, educators, or community members. Often the projects are real-world work such as creating a new playground or supporting another school in facility development. Other times, projects may be areas of inquiry such as the potential of skyscrapers to become more “green.” The idea is discussed and eventually turned into a "driving question" that will become the basis of the project design. The project design is then vetted by a team of teachers and others who were not part of the creation of the design. The vetting team provides critical feedback to the design team, allowing editing or abandonment. There is variety in the credits available through each project so students can keep moving toward graduation. During the final year of enrollment at ACE, each student must apply to participate in Capstone, which is a requirement for graduation. The Capstone Project is an intensive, final-year, real-world project that investigates aspects of the design and construction process. 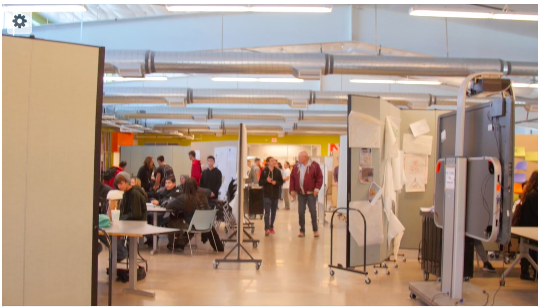 Students collaborate in teams to research, create, and publicly present on topics, including construction management, heating and cooling systems, structural and foundation systems, architectural design, and communication strategies. Since the Capstone Project is a real project in the community, students work directly with professionals in the building industry who provide continual feedback and mentoring. Each teacher and student participates in two projects each trimester. Core subject credits and some elective credits are earned through completion of projects. Additionally, students are required to take Spanish classes and participate in basic skills remediation during advisory time. Students earn physical education credits through daily morning workouts and recreational games that occur each Wednesday. Assessment of student character is continuous at ACE. Each student is expected to build his or her reputation every day by demonstrating professional behavior. Assessment of attained knowledge and skills occurs at the conclusion of each project. A student participates in two projects every school term. The learning outcomes related to each credit being earned are established at the beginning of the project. Credits are earned through a demonstration of mastery. A public exhibition is held at the end of each term when students complete performance assessments of what they have learned and how they have grown through completion of the project. Students receive feedback during this process from teachers, peers, family members, and community members. Performance assessment is highly rigorous. The performance assessments, in addition to evidence of learning produced during the project, are translated into a traditional grade that is required for the transcript. If a student demonstrates mastery of 90-100% of established outcomes, the student receives an A for that course. If a student demonstrates mastery of 80-89% mastery, the student receives a B for that course. If the student is still working toward mastery, the student receives an I (incomplete) and will have the opportunity to complete the course at a later time. If a student does not provide enough evidence to determine mastery, the student receives an F for the course. Since ACE is a public high school, all students participate in all state-mandated testing. ACE is in the process of developing additional assessments that will better reflect the authentic learning that happens at the school. Throughout a student’s enrollment at ACE, he or she is continually developing a professional resume. This includes information about specific projects and skills. The goal is for the graduate to have a resume that he or she can use to take the next step of looking for a job or pursuing further educational placements. Faculty collaborate in the planning and execution of projects every term. There are no subject-area departments. After projects are selected for the coming term, teachers arrange themselves into work teams for the projects. Two or three teachers combine to lead each project. Every teacher is responsible for working on two projects each term. The student support team (three social workers, an achievement coach, and a director) and the community engagement team round out the division of staff to support the "three pillars." Schedule is geared to time of day when teens learn best and to allow for students who have jobs that end late in the evening. Morning advisory starts with morning meeting followed by morning workout. Monday/Friday afternoon advisory focuses on transition. Tuesday/Thursday afternoon advisory focuses on reading. All staff and students participate in Wednesday morning games. Teachers' contractual hours are from 8 am to 5 pm. All teachers have non-duty lunch (45 minutes). Teachers have common prep time from 8-9 am every day. 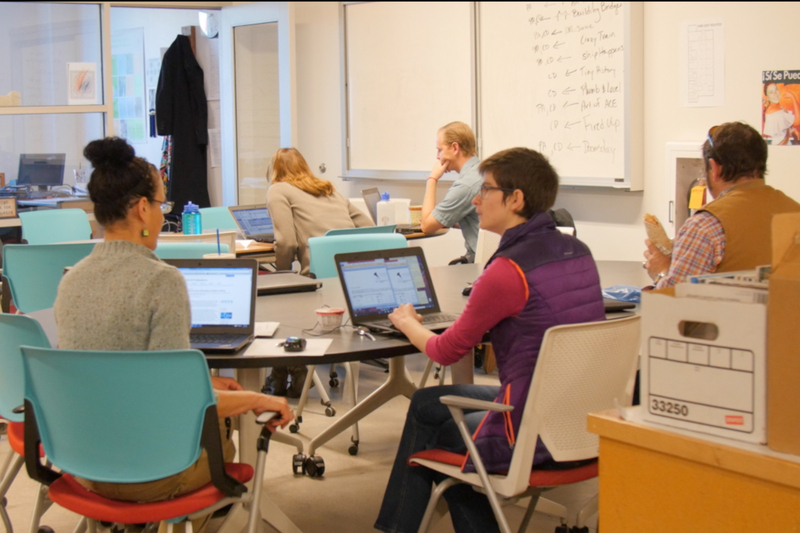 Every Wednesday, teachers meet for 1.5 hours of professional development after students leave. In July, all ACE staff members spend three weeks doing professional development. This time is utilized mainly for the creation of the projects for each term. Creation of the projects is an engaging learning process for teachers, school leaders, and staff. The student support center provides a safe place for students to go to talk and get any assistance they might need. There are four social workers at ACE. They are fully integrated into the life of the school, including sitting in on classes with students. They support students and redirect interactions to ensure that students are building community and working collaboratively. There is a very strong emphasis on character development and strong support from caring adults integrated into the life of the school. The result is a warm and caring community that helps each student succeed. ACE provides a warm, respectful, and collegial environment for its professionals. This includes several weeks of professional development each summer and ongoing professional development throughout the year. Teachers work in teams to develop and lead student projects, so they are continually collaborating and supporting one another. Teachers are encouraged to stretch themselves intellectually and creatively by developing projects in alignment with their own interests. They are also supported when working on important endeavors outside of school, such as furthering their own education. There are four social workers at ACE who participate in classes and meet separately with students and families. Each student is part of an advisory group led by a teacher. There is an onsite medical clinic. 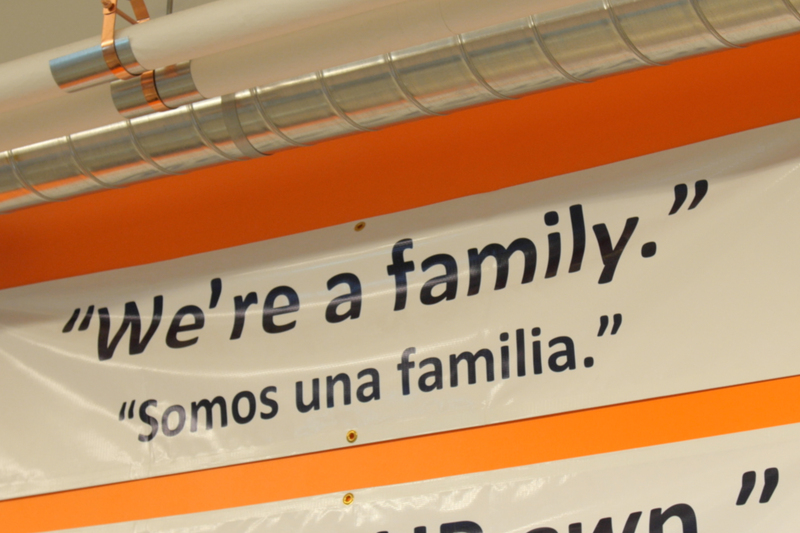 Administrators and support staff also play an integral role in supporting each student and family. Everyone works together with students and their families to ensure that each student can finish high school and transition successfully to work or higher education. Families are active in supporting each student’s education, including planning, reviewing progress, and participating in performance assessments at the end of each term. ACE is a high school where families are very involved in the educational process.